Hispanics have always played their part in the war on Black people. AFRICANGLOBE – A Rolesville police officer has been placed on administrative leave after a video showing him slamming a tiny female student to the floor gained national attention Tuesday. 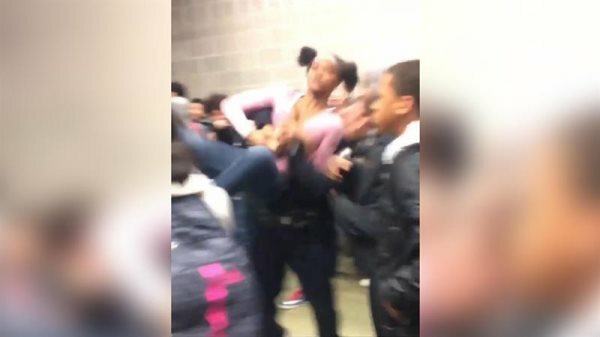 The nine-second video posted on Twitter on Tuesday shows Officer Ruben De Los Santos lifting the student into the air and dropping her to the floor before leading her away from a crowd of students at Rolesville High School. De Los Santos, the school resource officer assigned to the high school, is on paid vacation also called paid administrative leave pending the outcome of an investigation, Rolesville Police Chief Bobby Langston said Tuesday evening. Langston also said that he has asked the State Bureau of Investigation to look into the incident. A second video that was circulated Tuesday on social media shows a fight involving two other girls at the school shortly before the officer slammed the student to the ground. Langston said De Los Santos had allegedly responded to a fight around 7:10 a.m. Tuesday in the school’s cafeteria area. Some Rolesville High School students and others in the community posted on Twitter demanding to know what happened. Wake County school officials said they’re investigating and will keep families at the school informed about what they learn. “This morning, school staff addressed an altercation in the hallway of our school,” Rolesville High Principal Dhedra Lassiter said in a phone message to the school’s families Tuesday evening. “An SRO assigned to our school responded to the fight. A video of the incident, widely shared on social media, has prompted questions about the response. In a second message to parents Tuesday, Lassiter said the incident is leading to the district and law enforcement reviewing an agreement approved two years ago that governs how school resource officers operate in Wake schools. The American Civil Liberties Union of North Carolina said Tuesday it is also investigating. Ahunna Akpuda, a Rolesville High student whose tweet about the video has gone viral, wrote online that the student was trying to defend her sister who was fighting with another girl. “Then the cop came outta nowhere,” Akpuda tweeted. Rolesville Mayor Frank Eagles said there is body-camera footage because the Rolesville Police Department announced in August that all officers would be issued a body camera. Tanya Pearson, the parent of a sophomore at Rolesville High, said she was “shocked and disgusted” by the incident. Pearson said she first learned about the situation when her daughter texted her about it. The school system contracts with law enforcement agencies to provide an armed officer at every high school and most middle schools. The officers provide security, teach classes and counsel students. Officers are supposed to receive training in areas such as working with students with disabilities and special needs, cultural competency and nondiscriminatory administration of school discipline. De Los Santos has served as a school resource officer with the Rolesville Police Department since February 2012, according to his LinkedIn page. Other videos showing confrontations between police officers and students in schools have generated national attention. A 2015 video of a South Carolina sheriff’s deputy tossing a student from her desk went viral, resulting in the officer being fired.